UIDAI may be planning to release the mAadhaar app on iOS in the coming days, but it needs to squash the bugs and fix the security loopholes in the Android version first, because it continues to remain a privacy and security nightmare. It’s been a case of one misstep after another and with Aadhaar itself embroiled in huge controversies for exposing personal details of millions of citizens, it isn’t exactly a huge shock that the mobile app isn’t faring any better. 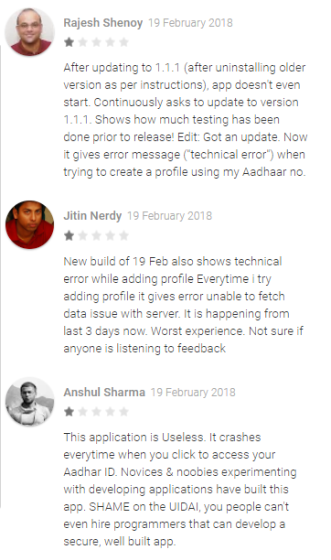 In what appears to be yet another major goof-up by the Unique Identification Authority of India (UIDAI), the latest version of the mAadhaar app released on the Play Store yesterday (version 1.1.1) seems to be incompatible with the previous version. That’s right, UIDAI is officially asking users to uninstall the earlier version of mAadhaar to be able to install the new version on their devices. “Uninstall the previous version before installing the new. If you update the older version with the new version, the app may misbehave”. Security researcher Baptiste Robert, a.k.a. Elliot Anderson, who has been following the mAadhaar saga from the beginning and warning users about security loopholes, jumped on the latest goof-up from UIDAI, mocking of the organization’s incompetence in handling something of this magnitude. He had earlier accused the app of being a ‘copy-paste job’ that lacks the sophistication level of a ‘school project’. Reviews on the Play Store also suggest that the update has caused more trouble than it intended to fix. He has also accused the mAadhar developers of being ignorant and lacking the basic knowledge of using Google Play Store developer keys.